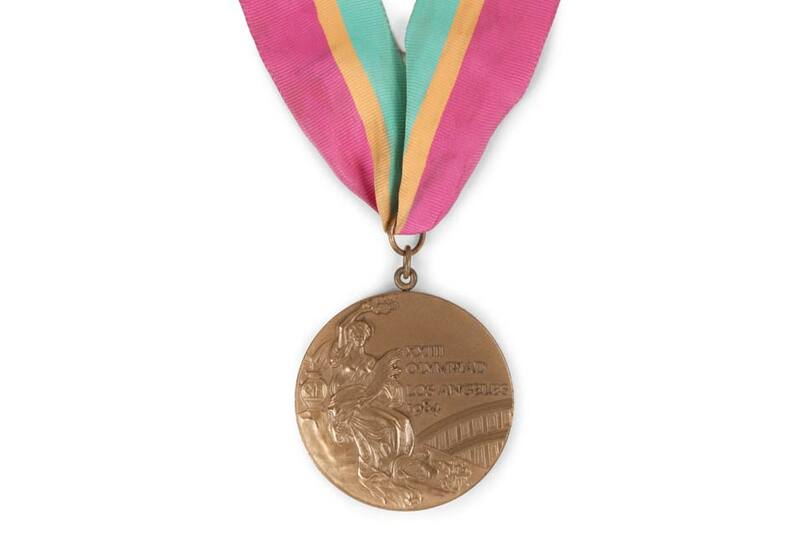 Evander Holyfield's 1984 Summer Olympics Bronze Medal (Los Angeles). The medal is for his win for the Light Heavyweight class. BEVERLY HILLS, CA.- Julien's Auctions, the world's premier sports and entertainment auction house, announces the auction of exclusive Property From The Life and Career of Evander Holyfield, an unprecedented array of boxing memorabilia, household items, vehicles, jewelry and personal property being offered at auction on Friday, November 30th, 2012. This historic collection of memorabilia from the worlds only five-time heavyweight champion in boxing history is a once-in-a-lifetime opportunity for fans, investors, museums and collectors alike to join in the celebration of the career of one of the greatest fighting champions of all time. With 44 wins, 29 by knockout, and a career that has spanned almost three decades, Holyfields record demonstrates the focus and commitment to excellence of a true champion. Holyfields exclusive collection features an assortment of memorabilia from every stage of his career  from his teenage years to his recent 2011 fight. This is the first time such items from Evander Holyfields personal collection have been offered publicly for auction. An amazing array of WBC, WBA and IBF Championship belts will be offered in the sale including Holyfields first ever professional title belt for his 1986 WBA Cruiserweight title. More than 25 framed fight-worn robes and trunks are included including those worn by Holyfield for his 1996 upset of a then-heavily favored Mike Tyson. The 1996 fight resulted in the retention of his WBA Heavyweight title with the fight being named Upset of the Year and The Fight of The Year for 1996 by The Ring magazine. Some of the key artifacts of the Holyfield Collection are his numerous championship rings including Holyfields individual rings commemorating his unification as Undisputed Heavyweight Champion, Two-Time Heavyweight Champion, Three-Time Heavyweight Champion and Four-Time Heavyweight Champion. Matching the impressiveness of Holyfields championship rings are his championship trophies including his 1992 WBA Boxer of the Year award. For the pure boxing and sports collectors there are autographed items including training worn boxing shoes, trunks, robes and shirts. There are also many signed promotional posters and photographs from the fights throughout Holyfields amazing career. The auction will also feature items from Holyfields life outside of the ring including furniture and decorative items from his residence and clothing from his custom made wardrobe. Fine womens and mens diamond jewelry, and watches from Rolex, Cartier and Patek Phillippe. One of the feature vehicle attractions will be Holyfields 1962 Chevrolet Corvette. The red painted speedster was manufactured the same year that Holyfield was born and was one of the first significant purchases of his professional career. From his humble beginnings as a teenage boxer in Atlanta, to his storied and fabled career inside professional arenas around the world, Evander Holyfield has demonstrated his commitment to excellence at every opportunity he has been given, enabling his professional record, and his fists to speak for themselves.